The climate in the room is marked by stretches of tension balanced by gusts of laughter that both recharge our energy and distract us from noticing what’s at the core. In some ways, it is easier not to act, to poke holes at every suggestion, to discard new ideas as farfetched, to resist changes with comments that reinforce the collective fear that sits just below the surface. I find myself drifting, letting the discussion fade to a background buzz. A cold, hard reality both frightens and saddens me: We aren’t going to make any decisions, and we won’t make any progress on this issue. Again. What are we afraid of? We live in a culture that prides itself on achieving the “Ideal.” A quick scan of popular slogans says it all: “The Relentless Pursuit of Perfection”; “Committed to Excellence in Education”; “Optimal Health Care.” We set our sights high, proclaim lofty visions, and publish bold mission statements. Doing so helps us feel competent and purposeful. It signals to the world that we are unstoppable. This is good, right? This cultural focus keeps our standards high, motivates us, helps us confront challenges with confidence, and pushes us to do our best. Or does it? Perhaps there was a time when this kind of thinking was useful. But when the challenges we are confronting are complex, uncertain, and largely adaptive (i.e., cannot be solved by edicts and experts, but require that people change their behavior), this pressure is counter-productive. It keeps us paralyzed by fear of failure, blinds us to possibilities, impedes needed learning, and gives rise to the Blame Game, played vigorously throughout many organizations today. Amy C. Edmondson addresses this concern in her recent article Strategies for Learning from Failure. She calls attention to the prevalent belief that failure is bad. She points out that, in fact, the reasons for failure fall on a continuum from blameworthy (deviance, inattention, lack of ability) to praiseworthy (hypothesis testing, uncertainty, exploration). 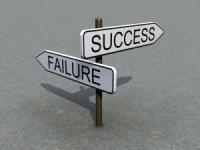 And while executives interviewed agree that only 2 to 5 percent of the failures in their organizations are blameworthy, they admit that 70 to 90 percent of those failures are treated as such. Our cultural aversion to failure undermines our stated high performance standards. We underplay or deny failures, leading to more serious problems later on. We test prototypes only in optimal conditions to ensure “success” and miss the chance to collect valuable performance data in more typical, real-life circumstances. Fear of blame and retribution reinforces employee isolationism, anxiety, and distrust, resulting in self-preserving, conventional thinking and decision making. Finally, we pass over important organizational learning opportunities while we waste resources on repeated exercises in futility. In my current situation, our group is avoiding taking action on a pressing issue, preferring the perceived safety of doing nothing to the perceived danger of making a mistake. But here’s the rub. When the challenges require adapting our behavior, updating our mental models, or discovering more effective ways of working together, we need to experiment, build collective will, and increase our capacity to learn and act together to make the changes we want. We need the psychological safety to practice as novices, fail, learn, modify, try again, and amplify what is working. We need to be imperfect but good—good enough to move forward, baby-step-by-baby-step, with our senses open, minds sharp, and organizations responsive to the future no one can predict. We need progress, not perfection. I hold my breath; the room is quiet for a few seconds. I see a few heads nod, slowly. One older woman speaks, “I think we have to try something. Can we start this pilot soon?” The conversation starts up again, with voices chiming in on how to set this up, who to involve, what to communicate to the larger organization. I watch the tensions ease and the possibility of hope start to fill the room. It feels good—good enough. Deborah Gilburg is a principal of Gilburg Leadership Incorporated (or GLI), a second-generation, family-owned, leadership development firm committed to helping leaders and their people adapt to the current needs and opportunities they face; she is also a special guest contributor to Rethinking Complexity. She earned a J.D. at Suffolk University Law School and a B.A. in Psychology at Trinity College, Hartford, CT. NOTE: This post was originally published by Pegasus Communications‘ blog, Leverage Points, on June 21, 2011. It has been republished here with permission.